And their next target is... Jemini! When Jemini's wormhole device scrambles her destination, she finds herself facing an enemy any traveler would run from... across galaxies AND times! 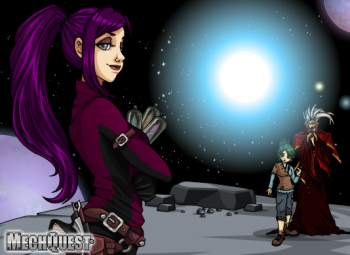 Korin, Maegwyn, and the MechQuest team have joined forces with Ghost and J6... and the next explosive (literally!) mission in the March of the Shadowscythe finale is almost upon us! Prepare yourself, pilots, because you're about to battle something that NO sane student (or Master, for that matter) would willingly face. And you'll need to win... or the Universe bites the big one! * Backgrounds will change; they are not quite done.